The global spending on Internet of Things has grown up exponentially and is expected to reach 1.29 trillion dollars in 2020. 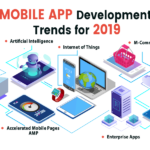 As per a research conducted by IDC, this technology is expanding fast and has become so popular that many industries like transportation, manufacturing, utilities, insurance, smart building etc are investing heavily here. Due to the huge investment by various industries, IoT has become a hot trend in the market of technology innovation. It has been found that smart home has become the most searched query associated with IoT on Google and it has obtained more than 19 million results. In the residential sphere smart home automation is regarded as the most revolutionary ladder of success with respect to IoT. 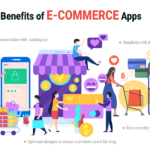 It has in fact made lives easier and simpler by creating smart homes where all the manual work can be done automatically with the help of networking of home appliances. The home appliances are actually controlled and connected remotely by a smartphone having a strong internet connectivity. This technology helps in controlling your home appliances from anyplace and at anytime as per your convenience. 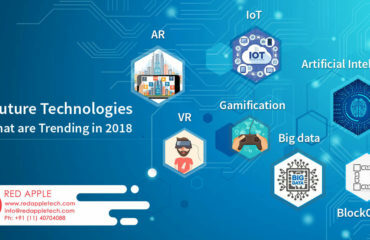 The benefits of this connected technology is huge and and is a new trend of digital innovation. According to a research conducted by IDC, investments for smart homes by consumers will be more than double and is expected to be beyond 63 million USD by 2020. High comfort, improved safety, increasing convenience, cost up-keeping and saving on energy are some attributes for which this futuristic technology is gaining momentum in the space of smart home automation. IoT services can can definitely enable you experience digital advantages to enrich your homely comfort. This article can give you some insights to control your home by a handy device. Now let us take a close look how a system of home automation can become an attractive choice for you. Remote Access: With IoT technology you can experience enormous convenience in fulfilling your wishes as per your order. Just imagine that you can adjust the temperature of your AC, switch on or off your lights, water plants, turn on your oven to get pre-heated and lots more by using your smartphone. So with the real time status of your home appliances on your mobile, you can leave happily for your vacation with absolute peace of mind. Conserving Energy: Side by side with automation, the connected technology of IoT is making homes smarter with respect to consumption of energy. It facilitates in making the residential space energy efficient. Energy consumption can be accomplished successfully when the system gets monitored by some products, get equipped with the knowledge, gather insights, and then control the appliances accordingly can save a lot on energy consumption. For example-Smart thermostats can learn the schedules of temperature and light preferences and can make suggestions accordingly for the best settings in which the temperature for AC gets automatically adjusted or even the lights in the room get turned off/on automatically. Similarly, the induction cook-top stoves can adjust heat when covered with metal pans. But when it remains uncovered, no burner will run. It results in less energy consumption for cooking eatables. 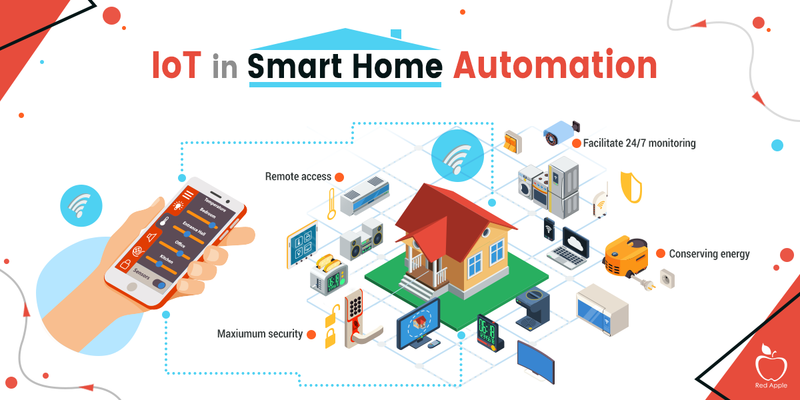 Facilitate 24/7 Monitoring: Now once you become aware about the advantages of smart home automation, you may think about minor leakages or flaws in the system or even variation in the performances of the appliances. So to make the owners informed about those defects, sensors are attached to the monitor of the appliances which helps in keeping records for the changes. This helps in taking adequate measures which prevents major issues affecting the smooth flow of the system. Maximum Security: You cannot keep a watch on your home to ensure utmost security from intrusion. It actually becomes a potential issue when you have to be out from your home for a long duration. Also if any accidental fire breakout takes place then it may pose serious threat for your loved ones. There are some tangible security measures such as automated door locks, surveillance camera, fire alarms, motion detection systems that can be connected with a smart home system for ensuring safety and security in your absence. For example-The motion detection system is capable of detecting any motion in the home and can instantly report to you by locking the doors. Similarly, fire alarm after detecting smoke can give a buzz and notify on your mobile phone to initiate necessary actions. The security system actually helps in ensuring that all doors and windows are locked and if not will alert you to do it by a single click. Easy to Scale: As the technology is changing rapidly, today’s state of the art appliances may not be impressive tomorrow. It may also happen that you want to have new appliances. 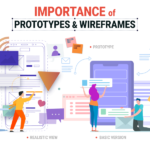 Here also home automation plays a pivotal role with respect to flexibility and scalability in replacing older appliances or even in case of adding more appliances to your existing network. The replacement, addition or deletion of the devices is pretty convenient for the home owners and it enables them to remain updated with the current technology. 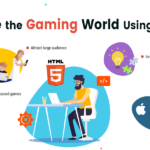 We being a popular brand in the domain of providing IT services are proficient in this technology and have served many industries in upgrading their business process. 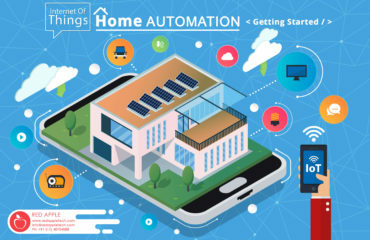 Conclusion: From this post you can come to know about the benefits of IoT based home automation which can offer you ultra convenience and comfort of experiencing safety and security. Moreover, it also help you save cost on energy consumption along with opting for updated appliances for more relief. 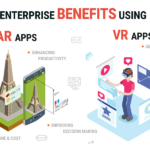 Examples have been cited to enable you know the advantages of IoT in a lucid manner. How Internet of Things (IoT) Plays a Major Role in Home Automation? 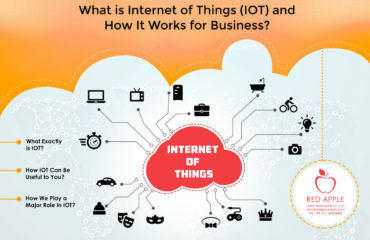 What is Internet of Things (IOT) and How It Works for Business?